Following our last discussion about a beautiful outline of the forehead, in this article, we will take a look at minimally invasive rhinoplasty techniques using dermal filler, botulinum toxin, and thread. The nose, due to its central location of the face, has important influence on the aesthetics of the forehead, eyes and mouth, etc. The height of the dorsum is lower in Asians compared to other races and that is why augmentation rhinoplasty is one of the most frequently carried out procedures in Asia. However, minimally invasive techniques had not been suitable for alae reduction, creating a narrower and sharper nose, or nasal hump reduction, which could be better addressed through surgery. A new minimally invasive rhinoplasty technique uses dermal filler to bring results comparable to that of surgical augmentation with high patient satisfaction. 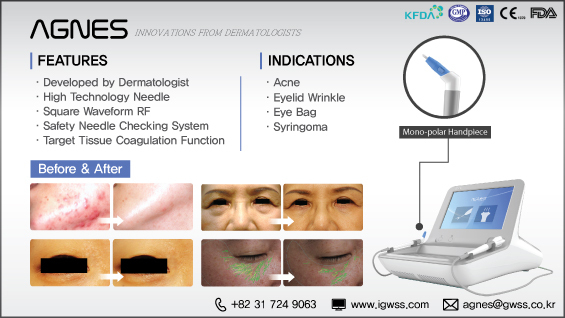 Its popularity may be due to the little disturbance to daily life, and low risk of post-treatment edema or bruising. The aesthetics of the nose differ across races and regions. Also different societies have different trends and standards regarding the beauty of the nose. Therefore, it would help to revise the standards of the textbook as suitable for each race. As the nose is visually the highest point of the face, it is also important to talk with the patient about what he/she wants to change the most, rather than blindly follow the trend. Anatomically, ideal angle measurements of the nose are as follows; nasofrontal angle 115~130°, nasofrontal angle 35~40°, and nasolabial angle 90~110°. The soft tissues of the nose generally consist of the skin, thin fat, SMAS, deep fat, and perichondrium and periosteum. Dermal filler injection targets the deep fat layer. This is to avoid the vascular passage. On the other hand, botulinum toxin injections target the muscle. Botulinum toxin is injected into the depressor septi nasi.muscle, nasalis muscle, procerus muscle and levator labii superioris muscle, etc. to adjust the horizontal wrinkles of the glabella, the alar size, or lift the nasal tip. The thread can be used to reduce the widening of the injected dermal filler through thread-induced fibrosis and contraction. The thread is also helpful when it is difficult to sharpen the nasal tip with dermal filler(Table 1). Table 1. 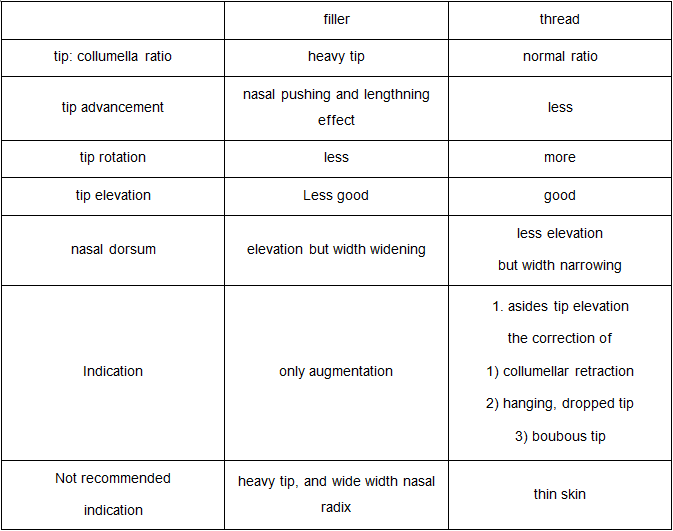 Comparison of dermal filler and thread in rhinoplasty.